 He broke the chains of his professional career to succeed in living his life. Turkish filmmaker Tolga Basol gave up his career to chase the dream of riding around the world. After working as a video editor and motion graphics professional for 13 years, Tolga Basol felt like a slave to the system. Working too much to get paid and no spare time for his riding. At some point he realized that a corporate career was not for him. His dream had always been to ride round the world (RTW) and continue for as long as possible. Tolga put his plan in action and worked hard to save up money for his RTW journey. He also developed his craft as a documentary filmmaker on several trips through Europe, The Middle East and Central Asia. Tolga finally made his dream come true by quitting his job this year. Getting sponsor support for his ride was the next major hurdle to clear. Tolga got in contact with KTM Turkey to tell them about his project. Originally, he planned to take the RTW journey on a KTM 690 Enduro R he had purchased. However, KTM offered to provide him with a new KTM 1190 Adventure R for the trip. This allowed Tolga to sell his 690 and put more money in his travel budget. Tolga began his trip this past June. He is now creating videos of his RTW journey and hopes to one day produce a movie with his footage. 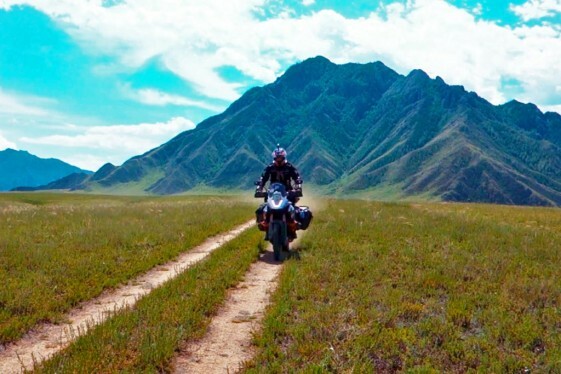 His first video shows his ride through Georgia, Siberia, Mongolia and Far Eastern Russia. This first stretch of his journey from Istanbul to Magadan took three months and covered 11,000 miles (17,649 km). Check out the great footage. I wish him well on his trip and hope he enjoys it… but I have to say this… this sort of thing is become all too common. Somebody decides to do a RTW trip or some other “extreme” type trip. And what do they do? Ask for corporate sponsorship. Whatever happened to doing it ON YOUR OWN and not ask somebody else to help pay for it? I can’t help but wonder just how many people are planning such trips JUST to try to get free handouts. Tolga is already an accomplished adventure rider and documentary film maker. I don’t have half his talent but if KTM came an offered to sponsor me, I sure wouldn’t turn them down. KTM, Klim, and others are big boys, I’m sure they know well how to separate the wheat from the chaff and not give expensive items to complete fools or charlatans.